Harry was 9 years old when he entered the care of The Children’s Society (then known as the Waifs and Strays Society) in 1903. The application for him to go into care, found within Harry’s case file, gives us information about his family. Harry’s father had died of typhoid fever when Harry was 7 years old. Since then, Harry and his two younger brothers had been looked after by their mother in Easingwold in Yorkshire. Harry’s mother suffered from a heart condition which left her unable to work. She received money for the family from the local Board of Guardians, but her poor health meant that she found it very difficult to look after her children despite this. It was decided, therefore, that Harry as the eldest son should be taken into foster care. The application form states that Harry, at 9 years old, was himself suffering from a ‘rupture of the bowels’. In later correspondence we find that this was an inguinal hernia; these are hernias in the groin and are one of the most common types of hernia found. Harry’s application to go into care was accepted. He was taken into Islington Home for Boys for four and a half months and then sent out to a foster home in Sawbridgeworth in Hertfordshire. 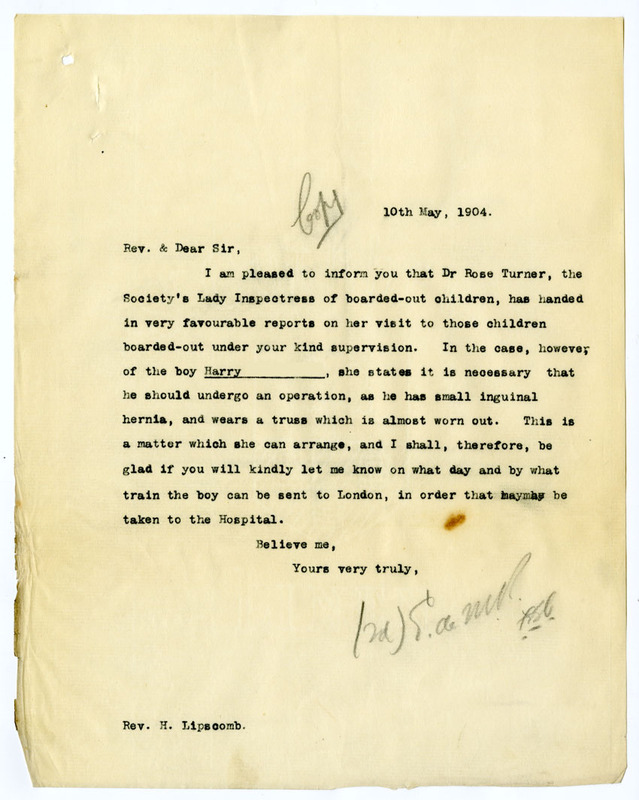 In 1904, a letter from Harry’s mother reveals that Harry wore a truss to support his hernia and that it had broken. This had caused Harry’s mother to ask for Harry to be returned to her, but on finding that the Board of Guardians had threatened stop their financial aid if he returned, Harry’s mother agreed for Harry to stay in care. Foster homes were inspected regularly by The Society to ensure that the children were well cared for. An inspection carried out at Harry’s foster home, shortly after the date of the letter from Harry’s mother, reveals the same information: the truss that Harry wore for his hernia was nearly worn out. 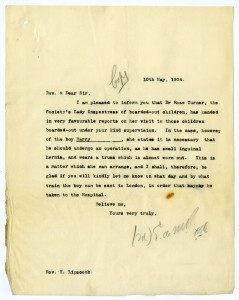 The doctor inspecting the home suggested that Harry’s hernia should be treated with surgery, as can be seen in the letter below. After gaining consent from his mother, Harry was returned to Islington Home for Boys in the summer of 1904 and from there he went to Charing Cross Hospital. At the hospital Harry underwent an operation for his hernia and was described as ‘doing well’ a few days later. Then, three weeks after first being admitted to hospital, Harry returned to Islington Home for Boys. It was recommended that on his return, Harry was to ‘keep a prone position’ for three more weeks. As Harry was now nearly 11 years old, it was considered that he was too old to return to his foster home in Sawbridgeworth. And so, after two months spent recovering from his operation in Islington, Harry was transferred to St Andrew’s Home for Boys in Reading. The next we hear of Harry is in 1907, when The Society opened St Boniface’s Home for Boys in Sampford Peverell, Devon. The master of St Andrew’s Home in Reading transferred to this new home in Sampford Peverell and we find that Harry (and presumably a number of other boys) had transferred to the new home with him. Around this time, with Harry soon to turn 14, another letter was received from Harry’s mother, asking for him to be returned to her in Easingwold. With one of Harry’s brothers at school and the other about to leave home, Harry’s mother was anxious that she would be left with no-one to care for her in her illness or to earn any money. Further correspondence in the file reveals that it was decided not to return Harry to his mother; no work could be found for him in Easingwold except for casual labour and it was thought that it would be best for Harry to go to a permanent job elsewhere. And so instead, in 1908, Harry went to work in domestic service at St Mary’s in the Scilly Isles. Harry worked there for a year an a half until we hear from Harry’s mother again. She had since remarried but was worried for Harry as he had written to her complaining of being unhappy in his job and wanting to go to work at sea. Further correspondence suggests that Harry was persuaded to give his current job another chance. It appears, however, that Harry continued to be unsettled in his job and in 1910, after working for two years, he returned to St Boniface’s Home in Sampford Peverell. Harry still wished to go to work at sea and so, after one month in the home, Harry returned to his family in Easingwold while the staff at the home attempted to find him work on a ship. Surprisingly, we don’t hear anything further about Harry until 1911 when he was 18 years old. In this year he writes a letter back to St Boniface’s Home stating that he has not gone to sea but has instead stayed near his family, and has been working on a farm near Easingwold for the past year. It is clear from the letter that Harry remembers his time at St Boniface’s Home with affection. This, unfortunately, is the last we hear of him. Whether Harry remained on the farm and what happened to him from then onwards is unknown. This case file is interesting on two counts. Firstly, it tells us how hernias were treated over 100 years ago, with the two treatments given to Harry, being a truss and surgery, still used to treat hernias today. It is worth noting that Harry was kept in hospital for nearly three weeks after his operation; far longer you might expect to stay in hospital these days. This may reflect on the differences in surgery techniques over the years as well as changes to the way hospitals operate. The other interesting part of the story lies with Harry’s mother. From the correspondence in the file we see that Harry’s mother, and her requests for her son to return home, were considered an unsettling influence on Harry. For the staff of The Society, what they wanted was to ensure that Harry had a bright future with a stable job; they didn’t want Harry to return to Easingwold unless there was a job there for him to go to. Looking at things from Harry’s mother’s point of view, we get a glimpse of what it was like for a single parent living with a long-term illness in the early 20th Century. Despite the money Harry’s mother was receiving from the Board of Guardians, it appears to have been hard for her, without a carer, to look after herself and the two children she had remaining with her. Reading her letters, it’s easy to see the conflict she feels between trying to do the best for Harry’s future while wanting him to return home to help with the family. This case file, then, appears to have a happy ending. Harry, no longer encumbered by his hernia, was eventually able to find a job close to his family. Whether things remained as bright for Harry in the years afterwards is something that only further research will tell.